When small white spots appear on the nail plate after removal of the UV nail color coatings, a likely reason is improper removal. Fortunately, the vast majority of this type of nail damage is completely avoidable. How? By taking the appropriate time, care and caution when removing UV nail color coatings, precisely following the manufacturer’s instructions, and fully heeding all recommendations. That’s good advice for removing any type of UV nail coating. 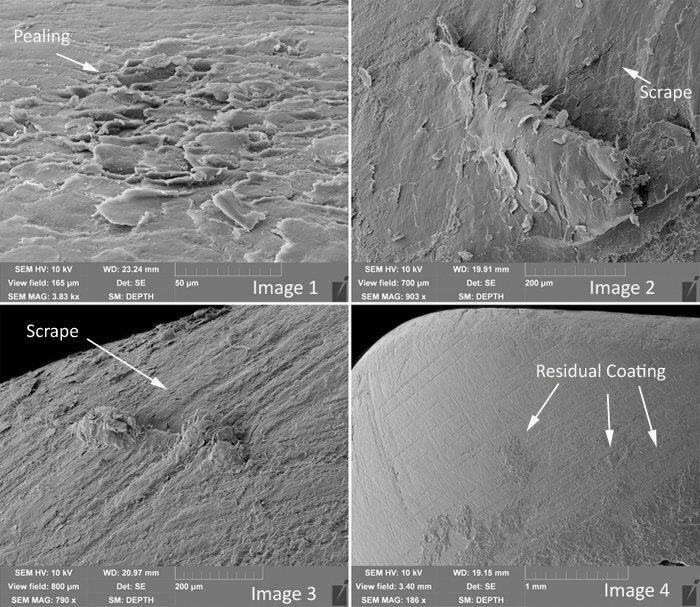 Below are four magnified images I collected, using a scanning electron microscope, to show the result of natural nail damage caused by improper removal of UV nail color coatings. Image 1 is magnified over 3000 times and shows damage caused by “prying” residual UV coatings from the nail plate. A large cluster of these can create the appearance of white to off-white spots or patches. Image 2 and 3 prove that even a wooden pusher can damage softened nail plates and bunch up nail cells like a throw rug sliding on a slippery floor. Look closely and you’ll see where a wooden pusher created the wide gouges leading up to these damaged areas that range in size from one half to twice the thickness of the human hair and smaller. Imagine the damage a metal pusher and heavy hand could do! The spots are small, but many of them bunched together create the appearance of a diffused white spot in the nail plate. Fortunately, this type of damage is avoidable for most people if these coats are properly removed. UV nail color coatings may not always be suited for every nail types, e.g. problematically thin or weak nail plates. As always, nail professionals should use their professional judgment when assessing a client’s suitability for any nail service. Image 4 is a nail magnified almost 200 times to show a surface scattered with islands of UV nail color coatings which were not properly removed. This is often how the damage starts. Overly aggressively scraping with any implement significantly increases the risk of surface damage. Filing away the residual coating with an abrasive can lead to excessive nail plate thinning. It’s best to follow manufacturer’s instructions and/or always allow sufficient time to properly soften the coating with an appropriate remover before attempting to remove it from the nail plate. If the UV coating hasn’t sufficiently softened, continue softening until the coating may be removed without damaging the nail plate. Don’t rush! ALWAYS take the necessary time needed to completely soften any UV coating before gently removing with a cautious approach and careful touch.